Ever get a song stuck in your head that won’t come out? That totally happened to me as I was trying to come up with a title for this post… no word of a lie, I spent the next two days with “Nacho Man” playing on loop in my mental playlist. I guess there are worse things to have on the brain than a bad case of nacho fever, though. Like that one week I spent humming “Mambo #5” uncontrollably. And of course, there’s Baby Shark, a tune so insidious that the name alone is enough to make every parent I know run away screaming. Incidentally, I’ve also had a major craving for these nachos stuck in my head for the last few days, because apparently gobbling up an entire skillet on my own wasn’t enough. I know that not everyone agrees with pineapple in savoury dishes, but I happen to have a long-standing love affair with Hawaiian pizza, which is why I decided to try using the same flavours for a fun twist on the usual nacho toppings. What’s not to love here? There’s saucy shredded chicken in barbecue sauce, sweet pineapple chunks, spicy fresh jalapeno, and loads of marble cheddar melted all over everything. Everything is piled high, two layers deep in a cast-iron skillet, to make sure that there’s plenty of toppings to go around. (After all, nobody likes a naked nacho!) 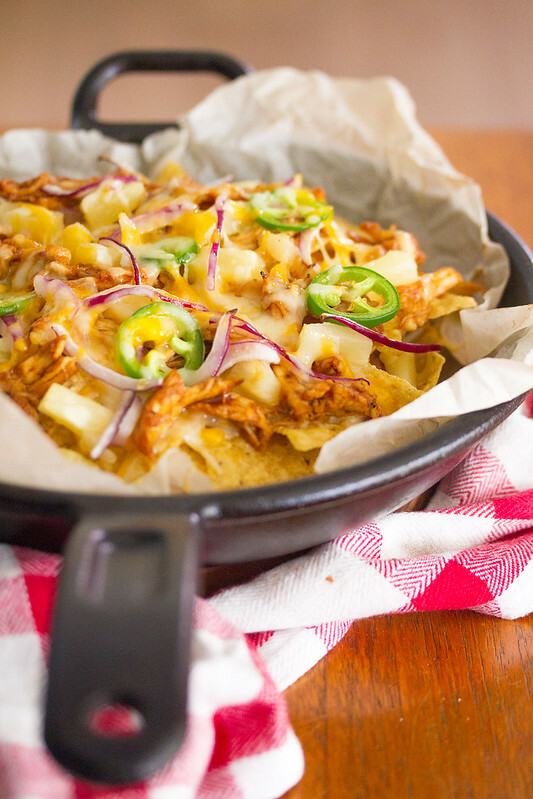 The cast iron skillet also acts as a serving dish, because it holds in the heat from the oven and keeps the nachos bubbly hot until the very last chip has been snapped up. The added bonus of this recipe is that it’s really fun way to transform your leftover roast chicken into something completely different, though you can always buy a quarter rotisserie chicken if you don’t want to wait that long. 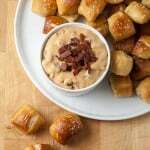 Let’s just say that you might just find yourself randomly thinking of these for days after they’re done. Eat your heart out, Mambo #5. 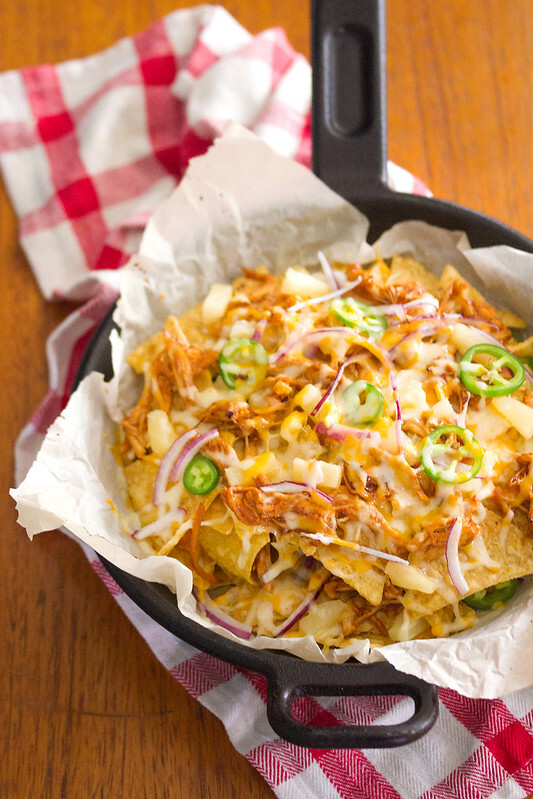 These sweet-and-spicy nachos are topped off with saucy barbecue chicken, pineapple, red onion, jalapeno and loads of cheese for a fun twist on the game-day favourite. 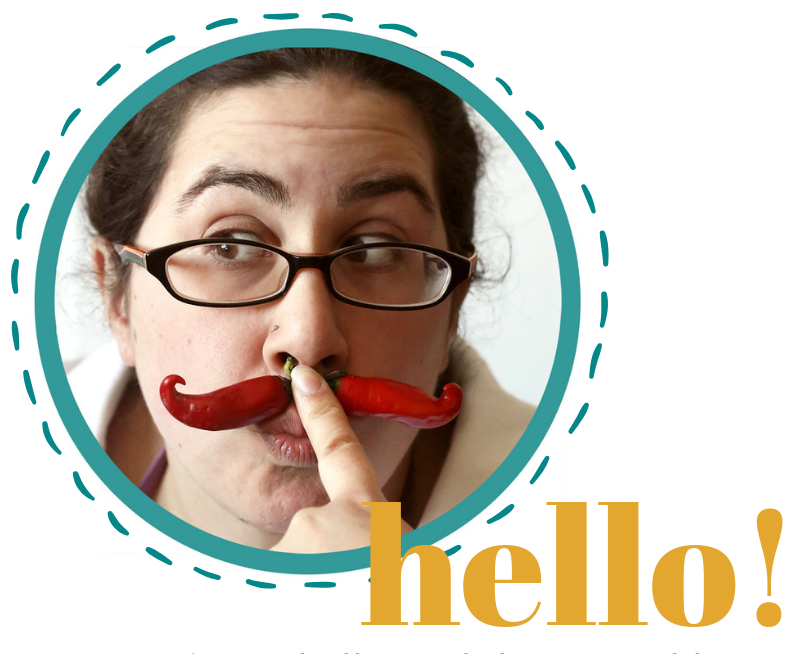 For a milder variation, swap out green bell pepper for the jalapenos. In a small bowl, combine the chicken and barbecue sauce, and stir until the chicken is evenly coated. 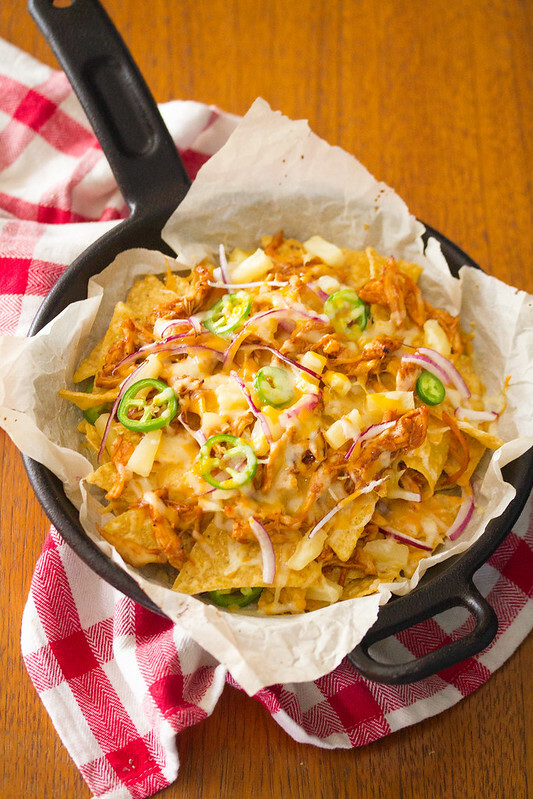 To assemble the nachos, arrange half of the chips in a large cast-iron skillet. Top with half the chicken, pineapple, red onion, jalapeno and cheese. Repeat the layers a second time. Bake in preheated oven for 10-12 minutes, or until cheese is melted and bubbly. If you don’t have a cast-iron skillet kicking around, you can also use any round oven-proof dish or even a baking sheet. It’s National Nachos Day! 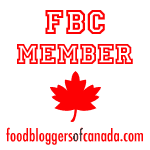 To celebrate, I’ve joined up with some of my favourite bloggers to share 10 tasty nacho-flavoured treats. 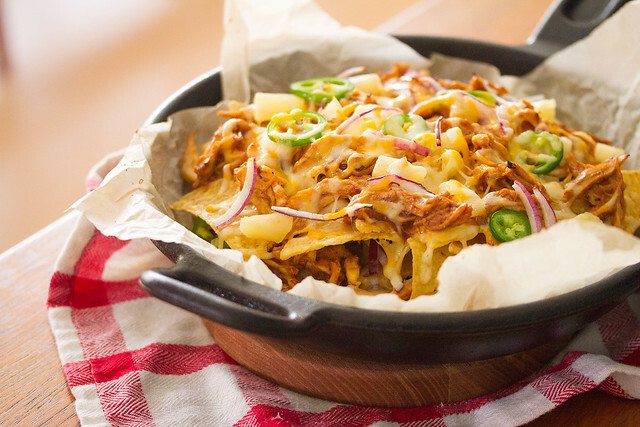 Hawaiian Barbecue Chicken Skillet Nachos from me! To be honest, I don’t know why I never thought of putting pineapple on nachos because Hawaiian pizza is delicious! I also love how nachos are the perfect vehicle for minimizing food waste – they’re so great for tossing all kinds of fridge leftovers on! I never would have thought of this combination of flavors, but now I am craving them! These nachos look fantastic! I need these in my life. 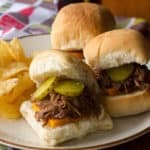 I loe the combo of smoky, sweet and spicy. 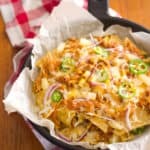 This is such a fun take on traditional nachos! My family loves sweet and sour, so these will be a hit for sure! 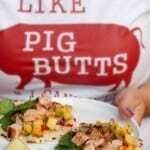 I would have never thought to combine those Hawaiian flavors with nachos! What a great idea! Of course, I will definitely be making a vegan version of this…soon! 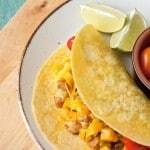 Love the idea of making these vegan! I bet they’d work really well with pulled jackfruit instead of the chicken.